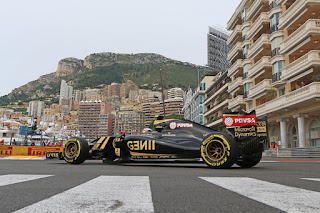 Talking about F1: The F1 blog: Monaco Preview: As big a change as we think? 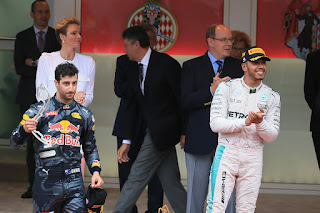 Once upon a time, Formula One fan and more general wit Clive James noted with typical dryness that "it is said these days with increasing frequency that Monaco makes a nice change from Grand Prix racing". And with the latest visit upon us, it's hard to argue. Really, what is it with the place and its 'jewel in the crown' status? There are so many reasons to dislike Grands Prix around the Principality. If you're to be critical, the Monaco round is an anachronism. If you're to be very critical, it's an absurdity. Narrow and bumpy, as well as a tortuously sinewy tunnel of barriers. Famously Nelson Piquet described its challenge as like trying to ride a bicycle around your living room. No-one can pass here, and that's been the way for decades. Qualifying does a lot to frame the race result. It doesn't get much better off the track either; cramped and claustrophobic as well as with various ostentatious poseurs on yachts who in all probability don't care much for the sport other than in that weekend. 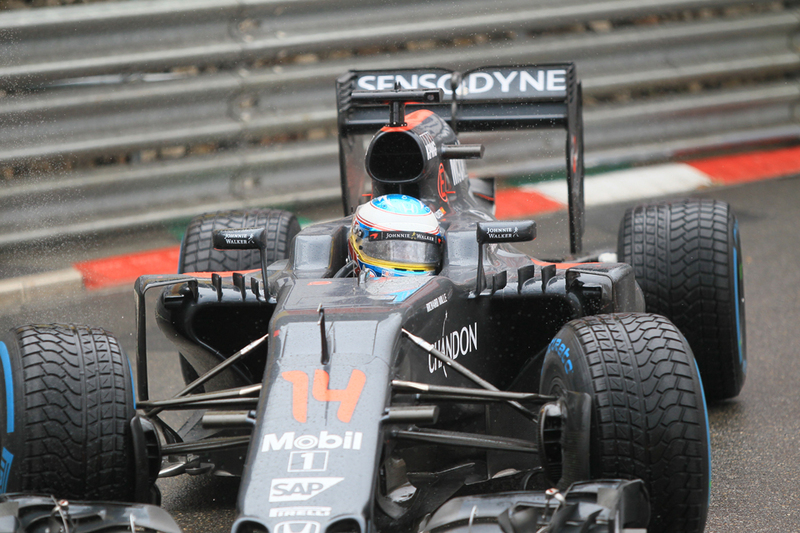 Among those 'brands' that make F1 what it is Monaco is chief among the very most important. Maybe it is the most important. Even those who've never seen a motor race will have a reasonable chance of pairing Monaco with F1 in a word association test. Does Lewis Hamilton start as favourite? Moreover, and like it or not, Monaco embodies much of F1's image, or at least the image which it likes to have of itself: glamorous, wealthy, eye-catching. Everywhere you turn in a Monaco Grand Prix weekend there is something visually captivating. It's no coincidence either that in off-track commerce this gathering has long been considered the most important. Few places embody the line of the sport's heritage as much either. And even with the criticisms outlined no other event on the modern calendar is such a driving challenge - of precision, bravery and concentration. Nowhere else is the driver able to make such a personal difference over and above their machinery. Nowhere else is there such a likelihood that even the smallest error will be punished by ending your day, a characteristic that's grown rare in this age of the car park run off area. Plus while the race is the slowest of the season nowhere else do you get a greater impression of speed of a Grand Prix car, as they flash between those near-at-hand barriers. Not for nothing either are many of the sport's giants of past and present multiple winners at this track. And to take ourselves back to the words of the inimitable Senhor Piquet, his celebrated Monaco line rather than said in contempt was in fact said with admiration - he followed it up with the view that a victory on these streets is worth two anywhere else. Somehow too Monaco is a place where things happen. While certain other tracks are associated with soporific fare somehow despite everything said that cap doesn't quite fit races here. 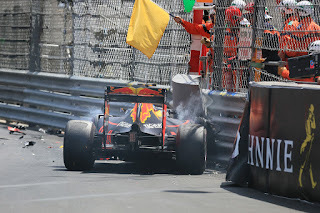 Sometimes Monaco's peculiarities lends to odd errors by drivers and teams (see Lewis Hamilton losing the race here in 2015 after being spooked into an unnecessary extra stop, as well as Daniel Ricciardo's slow stop having the same impact last season). And some part of this is that in another part of Monaco's sheer abnormality is that it's thought it can give us abnormal results. After all as any engineer will tell you if you were to design an F1 car solely for the Monaco weekend, without consideration of any other round, it'd look nothing like the F1 car we have grown used to. More specifically - thinking in terms of the Mercedes vs Ferrari scrap we've got used to in 2017 - a few this time have looked at Mercedes's longer wheelbase than the Ferrari as a guide, as theoretically the Scuderia's shorter wheelbase will be more nippy around the Principality streets. Yet more direct evidence points to advantage Merc. It's handy that Monaco follows on from the Spanish round as the tight final sector there is considered a useful guide to likely Monaco pace. 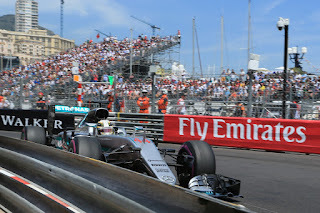 There in qualifying the Mercs remained one and two on the watch... Indicative perhaps of that while claims of Monaco's capacity to jumble the order have some truth they also can be overstated. That the best car remains the best car, even here. Max's presence may be instructive. If the Red Bulls should go well anywhere it should be here, given the track will show up its Renault horsepower deficit the least. And both Bull pilots not only have the sorts of skills and abandon that are served well here - let's not forget that Ricciardo got pole in Monaco a year ago and should have won the race too. Also without championship considerations and this rare opportunity for a better result they should be throwing caution to the wind. Precisely what you need around the Principality. There are a few driver considerations too. Hamilton's, Vettel's and Ricciardo's Monaco credentials are solid, but Valtteri Bottas has never scored a point here nor has ever got into the final part of qualifying. This may be explained by the Williams' characteristics rather than his own - indeed the man himself was talking in such terms in recent days - but it remains in advance a question mark. And in the same Barcelona final sector while Bottas was in second place he also was a quarter of a second off his team mate (and that's only over a third of a lap). And there are some considerations around Max too. He always is quick here, indeed his getting up to speed immediately having never turned a wheel here before in 2015 was something of wonder. The trouble is based on his previous he seems with it incapable of keeping his car out of the barriers for long. For him, more than most, his weekend will be one of how long he can keep his nose clean. Going further by the Barcelona final sector Force India is likely to again be best of the rest. 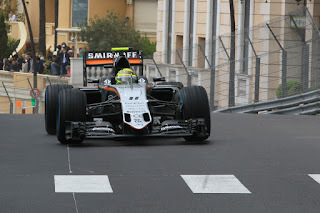 The Silverstone squad has a good Monaco record: last year Sergio Perez got on the podium (albeit aided greatly by inspired calls for when to switch to the inters and then the slicks) as well as got seventh here in 2015. Fernando Alonso going off to Indy has deprived us of another wildcard - he was eighth quickest in the Barcelona final sector as well as finished fifth here last year, while similar to with the Red Bull predicament the McLaren's Honda power unit millstone will be least shown up at this track. Yet Stoffel Vandoorne in his freshman campaign isn't up to speed yet (plus faces a grid penalty in any case) while Jenson Button's task stepping in for one weekend only - and here of all places - is likely to be Herculean. There's unlikely to be much strategy variation as all will try to keep stops to a minimum and prioritise track position. Even with a massive pace advantage overtaking is not on any agenda. Adding to this, despite its acrobatic appearances tyre wear is actually very low here due to the low speeds. One-stoppers barring disasters therefore can be expected. Reflecting this most runners have piled high on the ultra-soft compound, presumably aiming for a one-stopper starting on the ultra-soft then switching to the super-soft, and the former even last year when the compounds were less durable did well upwards half the race distance (both Mercs got 46 laps out of a set). The timing of the single stop may be based on a safety car appearance (which is likely here, at around an 80% chance), a Virtual Safety Car or else an opening of space on the track behind to drop the car into (the least likely scenario). 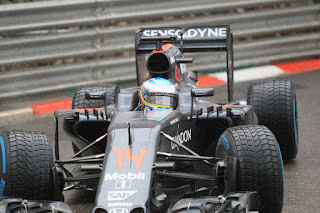 In previous years too many thought they could have done an entire race distance at Monaco on the soft tyre, had that been allowed, and it'll be interesting to see if any cars out of position this time try a marathon stint on them or perhaps even on the super-soft given as noted tyres are tougher now. It's something that's been rewarded before, such as in 2015 when Carlos Sainz started from the back after missing the weighbridge in qualifying, but got the final point after making his only tyre switch after 12 laps. At Monaco too there is often the possibility of rain, which indeed arrived last year, though forecasts have it dry and sunny throughout this time. Monaco's a nice change from Grand Prix racing, as Clive James opined with layers of irony. But this time, as in a few times before, it could be that the change won't be as great as we might assume.